The other day I mentioned I made gluten free pizza while Lael and Elise were here. You may have wondered why. Well, I discovered that Elise has recently found out she is mildly intolerant to gluten and I of course, wanted to be an accommodating hostess:) So I modified the Fresh Mozzarella, Italian Sausage and Roasted Red Pepper Naan Bread Pizzas I had planned. 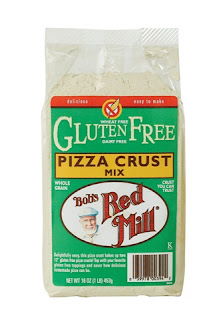 I simply replaced the naan with Bob's Redmill gluten free pizza dough. It turned out quite good! I have to say, I wasn't surprised at the lovely turn out given that I have never tried a Bob's product I didn't love! And for dessert we had Luna & Larry's Coconut Bliss Ice Cream topped with fresh raspberries! Oh my, it was y-u-m-m-y!! 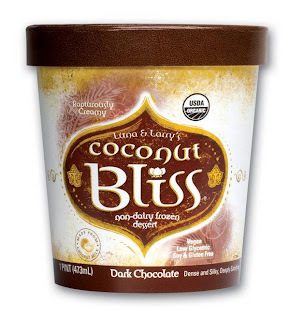 It had a very nice nutty flavor to it and it's totally organic, vegan and soy, dairy and gluten-free. I'm totally looking for an excuse to try some of the other flavors like: Chocolate Hazelnut Fudge, Naked Coconut and Cappuccino! Did I mention they are also sweetend with agave nectar?! Just to clarify, I am not promoting going gluten-free just for kicks, but Celiac disease, or an intolerance to gluten, is a very real thing and I'm so glad to see that there are tasty options out there. This is very helpful if you or someone you might be cooking for suffers from it. Of course, it is always nice to explore products made with good, wholesome ingredients:) It never hurts to get out of our comfort zone, especially with delicious foods! If this is something you might be interested in getting good recipes/ideas on, you may want to check out the blog: Gluten Free Girl! It's quite delightful! I know I've said it before - but you're so darn cute - how does your hubby stand it? Big hug - we miss you!! Tell mama we said hi! Have you been over to our blog? We're almost ready to bring Keira home - should be any day now when we get to see her face after four years! Christie, I MISS you guys too!!! In fact, you came up in a conversation last night:) I think it was in reference to your little cutie pie.